Richard Mille RM 008 - V2 Tourbillon Split Seconds Chronograph Limited Edition Watch 507.04D.91: This limited edition Rose, Pink ,Gold, Green, Yellow, and Red Crown Trim Dial watch features manual winding tourbillon movement with hours, minutes, chronograph, split seconds, power reserve, torque and function indicator. Also available in titanium, red and white gold. 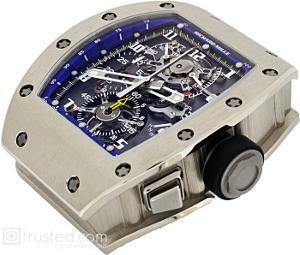 Richard Mille RM 008 - V2 Tourbillon Split Seconds Chronograph Watch 507.06.91: This white gold watch with a blue trimmed dial features manual winding tourbillon movement with hours, minutes, chronograph, split seconds, power reserve, torque and function indicator. Also available in titanium, red and white gold. 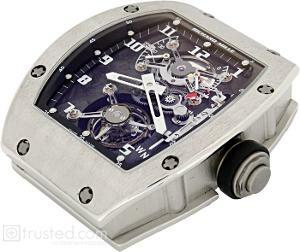 Richard Mille RM 008 - V2 Tourbillon Split Seconds Chronograph Limited Edition Watch 507.06C.91: This limited edition white gold watch features manual winding tourbillon movement with hours, minutes, chronograph, split seconds, power reserve, torque and function indicator. Also available in titanium, red and white gold. 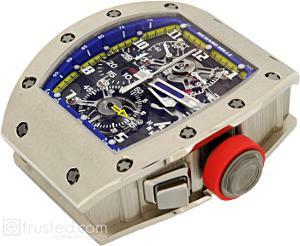 Richard Mille RM 008 - V2 Tourbillon Split Seconds Chronograph Watch 507.06D.91: This white gold watch with a red crown and a blue trimmed face features manual winding tourbillon movement with hours, minutes, chronograph, split seconds, power reserve, torque and function indicator. Also available in titanium, red and white gold. 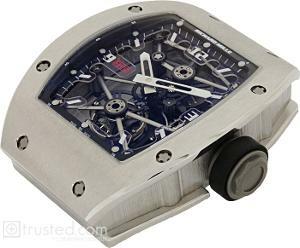 Richard Mille RM 009 Felippe Massa Tourbillon Grey Watch 508.43.91: This grey titanium watch features manual winding tourbillon movement with hours, minutes, chronograph, split seconds, power reserve, torque and function indicator. 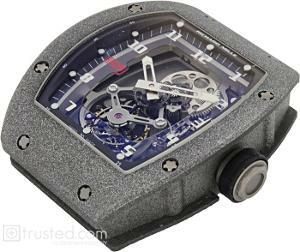 Richard Mille RM 012 Tourbillon Watch 512.48.91: This platinum watch with black trim features manual winding tourbillon movement with hours, minutes, power reserve indicator, torque indicator and function selector. 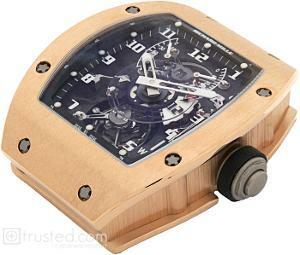 Also available in red gold, white gold and platinum. Richard Mille RM 010 Automatic Watch 509.064.91: This white gold watch with ruby baguette bezel diamonds features skeletonized automatic movement with hours, minutes, seconds, date and adjustable rotor geometry. Also available in titanium, red and white gold. 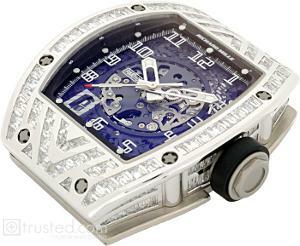 Richard Mille RM 010 Automatic Watch 509.067.91: This white gold watch with baguette bezel diamonds features skeletonized automatic movement with hours, minutes, seconds, date and adjustable rotor geometry. Also available in titanium, red and white gold. 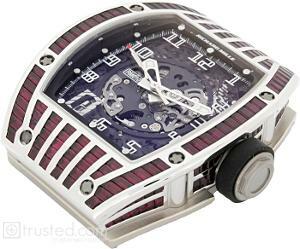 Richard Mille RM 010 Automatic Le Mans Limited Edition Watch 509.064.91: This Le Mans Limited Edition white gold watch with ruby baguette bezel diamonds features skeletonized automatic movement with hours, minutes, seconds, date and adjustable rotor geometry. Also available in titanium, red and white gold. 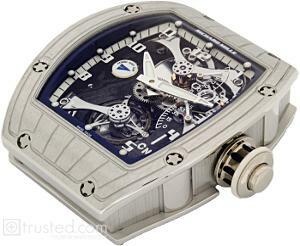 Richard Mille RM 015 Tourbillon Second Time Zone Watch 515.48.91: This platinum watch with blue trim features manual winding tourbillon movement with hours, minutes, second time zone, power reserve indicator, torque indicator and function selector. 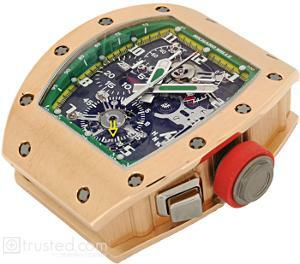 Also available in red gold, white gold and platinum. 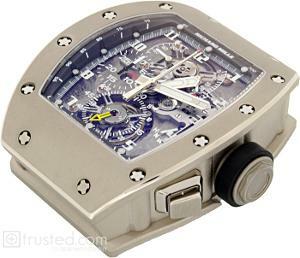 Richard Mille RM 001 Tourbillon Watch 501.48.91: This platinum watch features manual winding tourbillon movement with hours, minutes, power reserve, torque indicator and function selector. Also available in titanium, red gold or white gold, platinum. 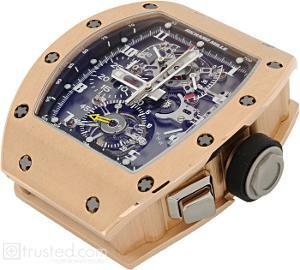 Richard Mille RM 003 V2 Tourbillon Dualtime Zone Watch 502.04.91: This Rose Pink Gold watch features manual winding tourbillon movement with hours, second time zone, power reserve, torque indicator and function selector. Also available in titanium, red gold or white gold and platinum. 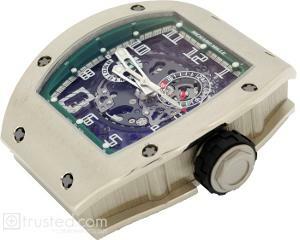 Richard Mille RM 003-V2 Tourbillon Dualtime Zone Watch 502.06.91: This White Gold watch features manual winding tourbillon movement with hours, second time zone, power reserve, torque indicator and function selector. 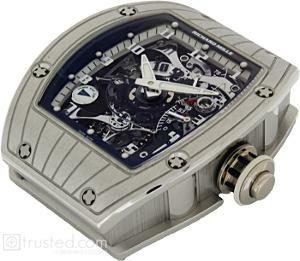 Also available in titanium, red gold or white gold and platinum.